Cursed soldiers have not laid down their arms after the end of World War II and objected to the Soviet Union. In Poland on 1st March 2016 we celebrated the National Remembrance Day of Cursed Soldiers in honour of steadfast militants. Both the residents of our town and our school were present in large numbers during the celebration. It's not the first time when we set out from our city Włocławek to Brześć Kujawski on the anniversary of rising battle in order to commemorate those who responded to the call of the National Government. The battle of Ciepliny starts rising wrestle 1863/64 in Kuyavia. Young people, who put honour and contempt for death above war craft, claimed freedom of their homeland. This was the last noble independence spurt redeemed by tens of thousands killed, condemned and forced to leave the country people. Flowers and memory lights at the insurgents’ grave were a symbol in remembrance not only of those whose names are well-known such as Józef Stępowski or Juliusz Erlicki but also of the unknown heroes from our city. In the early morning on 17th December 1863 the Russian court pronounced sentence on the Colonel. Stanisław Bechi had paid the highest price for his support to Polish insurgents. The invaders wanted Bechi’s name to disappear from our memory. After 152 years the memory of this hero is - still alive, as a tangible proof of it is our presence at the anniversary ceremonies. Going from prison to the place of Colonel’s execution we reminded the volunteers from France, Hungary, Slovakia and the Czech Republic, who shed their blood for our freedom. The insurgents had contributed to the reconstruction of our country - GLORY to the HEROES. Visit our gallery in order to see the pictures from the ceremony. From 13th to 29th October at the City Hall in Wloclawek you could see the exhibition of New Year's Taiwan woodcuts. Their formation involves the celebration of the Chinese New Year. Multicoloured compositions include New Year’s wishes - text and images depicting the tutelary deity, flowers, genre scenes and the most frequently occurring theme such as Chinese zodiac signs (twelve animals - rat, ox, tiger, hare, dragon, snake, horse, goat, monkey, rooster, dog and pig). All the images posted on woodcut prints have a symbolic significance – wishes of happiness, longevity, prosperity or wealth. Presented woodcuts are mastery complementing rich subject matter. This technique of Chinese coloured woodcut is characterized by the creation of prints with coloured water ink of stamping die. It allows artists to achieve amazing precision effects and make graphic closer to hand-painted pictures. The boards are distinguished by a multitude of colours, shades, delicate or, on the contrary, strong outline, or various compositions. Some of them combine the traditional technique of digital printing which highlights values such as tradition and innovation. The exhibition of Taiwan woodcuts is not only an excellent possibility of contact with a different culture, but also allows you to meet with the beauty of the master works which maintain Taiwan's tradition of folk art. The 9th September was a special date to our students because we hosted the representatives of Bucks University from Great Britain. 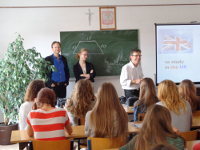 The students of our school had the chance to get acquainted both with a wide range of art courses which are offered by Bucks University and broaden their knowledge about animation which was perfectly presented by Alexander Williams – a famous animator and cartoonist who created animation and special effects for many well – known movies such as Harry Potter, Open Season or The Road to Eldorado. What is more, our guests went to the Diocesan Museum in Włocławek, where they had the opportunity to admire the post-contest exhibition of the III International Biennial of Miniature.